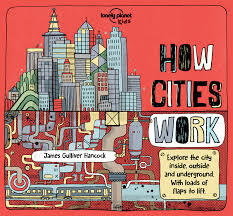 Through boldly black outlined double pages, James Gulliver Hancock, explains ‘How Cities Work’. 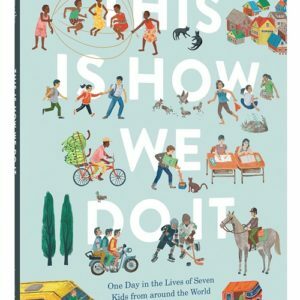 From the vast underground network of a city’s utilities and transport, to the role of green spaces, the evolution of high rise living, or the differences between a city at night or in the daytime, to cities’ culture and recreation opportunities, or the function of local government- this brilliant book expands on the roles, history and development of the world’s cities. Lift up flaps, diagrams and an army of clearly labelled texts lure the reader to discover more. I found myself poring over pages, asking Mr Bookwagon questions from his local government days. We wondered about which cities had been researched for the information, but none was particularly evident. While there are nods to North America, e.g., ‘City Hall’, there are also facts about the largest cities of South East Asia- as there should be. 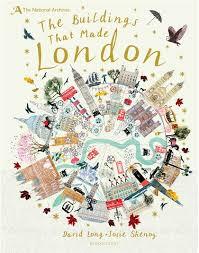 London, other British cities, and those of Europe are also evident in sections on the ‘build, build,build’ and city waterways. 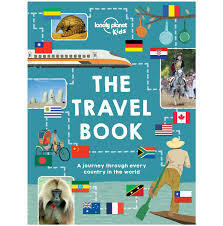 I could imagine my brother loving this book, spending hours reading, comparing, sharing and studying, becoming immersed in the clear, explicit pictures and really informative text. This is a superb book that I recommend highly. ‘How Cities Work‘ explains through diagrams, networks, examples, lift-up flaps and history, the way our urban centres proceed and progress. This is an intricate and fascinating title that we recommend highly.